Standards for precious metals in Switzerland originated in Geneva in the 15th century, the first recorded regulation concerning the fineness and marking of silver was enacted by Bishop John of Brogny in the year 1424. Regulations were later introduced in the cantons of Neuchâtel and Schaffhausen, each having its own standards for gold and silver, its own system of testing and hallmarking, and its own unique set of marks. To begin with the standards and marking were controlled by the local Guilds. Markham's "Handbook to Foreign Hallmarks" says that an Assay Office was established in Geneva on 22 September 1815, and one in Neuchâtel in 1839. These assay offices were established by law, superseding the medieval Guild system of regulation. These hallmarks were used for plate, vessels and candlesticks etc. They were not used on watch cases, I don't think there was any Swiss national legal control over the fineness of gold or silver used in watch cases until the Precious Metals Control Act of 1880. Until 1880 Swiss gold watches were usually stamped with the gold fineness, usually 14 carats, a popular standard on the continent, and silver watches were often simply marked "Fine Silver" or "Argent Fin", an unspecified standard of fineness. It was permissible in Switzerland to use base metal for the cuvette, the inner cover that protected the movement while a key was being used to wind it. This was often made of brass and silver plated. These are often marked "Cuivre" or "Metal". This was not permitted for British made watches, the cuvette or "dome" had to be made of the same material as the rest of the case. If it wasn't, none of the case would be hallmarked by the British assay offices. At one time I thought that the Swiss sometimes made the bow, the ring on the pendant, out of plated brass, but now I think that if a watch has a bow like this it is a replacement for an original bow that wore through. Although the Swiss Precious Metals Control Act of 1880 defined standards for gold and silver watch cases, the British Merchandise Marks Act of 1887 caused several changes in Swiss hallmarking, in particular the two Swiss standards for silver were not accepted in Britain, and the British also inadvertently caused the Swiss to create their own national brand or trade mark "Swiss made". Swiss hallmarking before 1880 and after 1933 is rather outside the scope of this page, but I mention some of the changes made in 1933. In Switzerland in the 1920s a system of responsibility marks for precious metal watch cases was introduced. These are called Poinçons de Maître, which translates literally as "Master's Punches" but are usually called "Collective Responsibility Marks". These can be used to identify the maker of a precious metal watch case. There is a full description of this system and tables of the marks at Poinçons de Maître: Case Maker's Marks. The Swiss Precious Metals Control Act of 23 December 1880 introduced a uniform system of hallmarking for watch cases to be used throughout Switzerland with the marks shown in the picture here. 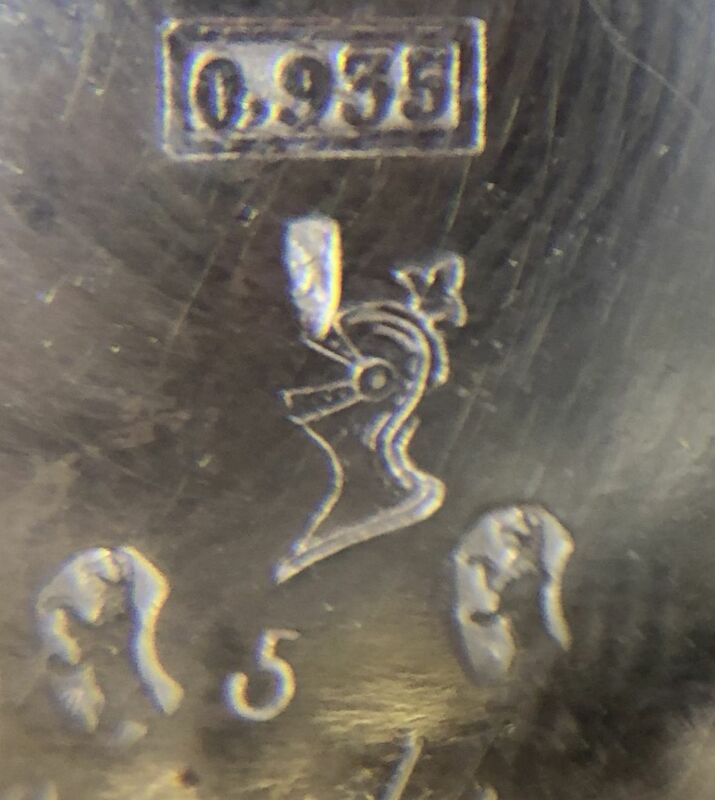 These hallmarks marks are seen on the vast majority of Swiss watches with silver or gold cases imported to the UK between 1880 and 1907 before assay and hallmarking of the cases of imported watches in a British assay office became compulsory. From 1 June 1907 Swiss hallmarks are rarely seen on imported watches; British import hallmarks appear instead, sometimes alongside Swiss hallmarks. British import hallmarks, like all British hallmarks since 1478, do include a date letter. The "standard" is the legal minimum fineness. This means the minimum proportion of precious metal (gold, silver, etc.) in the alloy. It is expressed as a proportion by weight, e.g. 18 carat gold is sometimes expressed as 0.75. This means that 0.75, three quarters, of the weight is gold, the rest is base metal. The alloy must assay at this standard in order to qualify to be hallmarked. To ensure that items pass assay, the alloy used by the goldsmith will be slightly finer than the absolute minimum standard. This is not shown by the hallmark, which records only that the item passed assay and was therefore of at least the required fineness. The table reproduced here uses the "per mil" or parts per thousand symbol ‰. It is like a percentage sign % but with two zeros below the line indicating that the ratio is per thousand, rather than per hundred used for percentages. Different expressions of the same number are often seen, e.g. the fineness of 18 carat gold might be shown as 0.75 (since 18 / 24 = 0.75), .750, 750 (without the decimal point), 75% or 750‰, meaning 750 parts per thousand. 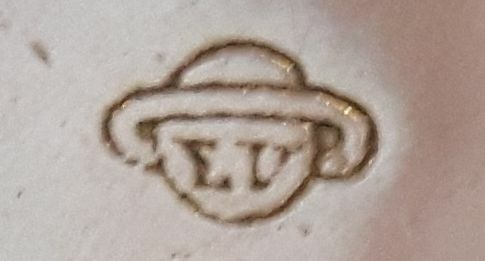 The small "x" shown in each mark is replaced by the identifier of the Swiss assay office or "bureau de contrôle" where the item was tested and marked; "G" for Geneva, "N" for Neuchâtel, "C" for La Chaux-de-Fonds. Both Biel / Bienne and Bern used "B", which was allowed because they are both in the canton of Bern. Watch cases would most likely have been marked in Biel / Bienne because it was closer to the centres of production. Basel used a star. Note that the Swiss/French word "contrôle" means to examine something, which is different to the meaning of the similar English language word. This led to some confusion during the Brexit referendum about what was meant by control of/at the borders. The 1880 Swiss Act introduced legal standards for gold used in watch cases in Switzerland. However, some other countries had slightly differing standards for gold and so some modifications were later introduced to accommodate these. The Swiss symbol for 18 carat gold was the head of Helvetia, the female national personification of Switzerland, which is also called the Confederation Helvetica (CH) or Swiss Confederation. The name is derived from the name of the ancient people of Switzerland prior to the Roman conquest, the Helvetii. The female figure of Helvetia appeared during the development of a Swiss national identity in the nineteenth century, and Helvetia appeared on coins and stamps after the foundation of the federal state of Switzerland in 1848. 0.585 and two squirrels Image © Bernd R.
The second standard of gold recognised by the 1880 Swiss Act was 14 carat. This was a standard of gold that had been used on the continent for many years and was very popular. 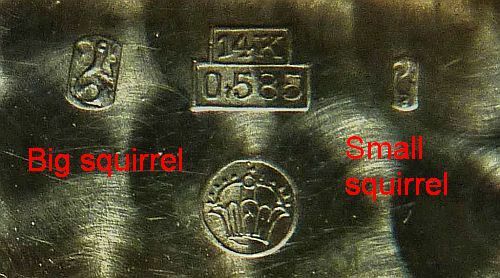 The Swiss legal decimal fineness standard for 14K was 583‰ as shown in the illustration of the marks, which was confirmed by the hallmark of a single squirrel. Fourteen carat gold is not quite as straight forward to mark as a decimal number as 18 carat because the percentage is not a round number; 14 /24 works out to 0.5833... with the 33 recurring to infinity. The Swiss authorities rounded this down to 0.583‰ but some countries such as Germany rounded it up to 585‰. Given the high cost of gold, this seemingly small difference was significant. 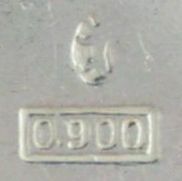 In order to show that an item had passed assay at the higher 0.585‰ standard, Swiss bureaux de contrôle were authorised to hallmark cases marked the decimal figure 0,585 with two squirrels, one large and one small on opposite sides of the decimal fineness mark as shown in the image here. The symbol at the bottom of the picture is the German Imperial Crown within a circle that represents the sun. 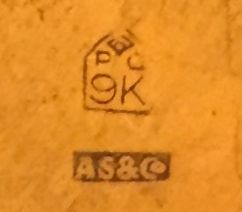 This mark was struck in Switzerland by the case maker (not a bureau de contrôle) on items that might be exported to Germany, but it does not show that the item was ever actually sent to Germany. The same is true of the mark of a crown and crescent moon struck on silver, see German Hallmarks. The Swiss Act of 1880 recognised only 18 and 14 carat gold as legal standards in Switzerland. This presented Swiss case makers with a problem. Nine carat gold was very popular in Britain because it was the cheapest alloy that could legally be called gold, but it was not a legal standard of fineness in Switzerland. Swiss watchmakers didn't want to miss out on this lucrative market so watch cases were stamped by the case makers with nine carat marks. Until 1924 these cases never went anywhere near an Swiss government Bureau de Contrôle because they could not be officially called "gold" or hallmarked in Switzerland. From 1924 the Swiss Federal Government allowed the Bureaux de Contrôle to stamp an official mark of the Swiss cross to be used on nine carat gold watch cases. For more details see Nine and 12 Carat Gold. From 1924 the Swiss Federal Government allowed the Bureaux de Contrôle to stamp an official mark of the Swiss cross to be used on 12 carat gold watch cases. For more details see Nine and 12 Carat Gold. Between 1880 and 1933 the legal Swiss hallmarks for silver were either a ‘bear rampant’, a bear standing on its hind legs, or a grouse. The requirements of export markets meant that some additional grades and standards were introduced, but these remained the basic standards until 1933. In common with all precious metal items that were to be submitted for hallmarking, watch cases were always made from an alloy of slightly higher finess than the legal minimum to be sure that they would pass assay; failure to pass assay would mean that the case had to be melted down and the alloy refined to a higher fineness, which is expensive in its own right, and the work that had gone into the case would be lost. The Swiss hallmark of a rampant bear indicates that the alloy contains at least 0.875, 87.5% or 800‰ (800 parts per thousand) pure silver, the balance being an alloying element, usually copper, that gave the alloy greater strength and wearing ability. This remained the Swiss ‘higher standard’ for items to be sold in Switzerland until 1933. The Swiss hallmark for silver of 80% fineness, 800‰ or 0.800, was the symbol of a grouse. 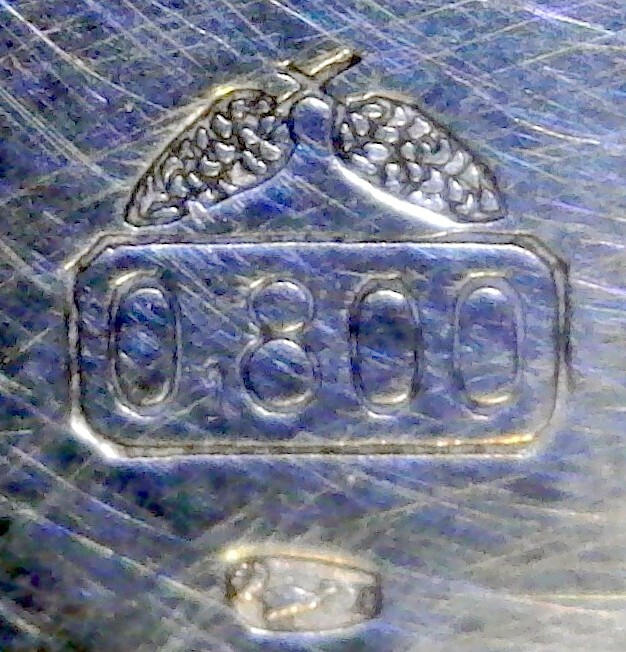 Sometimes the grouse mark on 0.800 silver is struck twice, a large grouse above the fineness mark and a small grouse below. This seems to be prevalent on cases with the German crescent or half moon and crown. This double mark seems to follow on logically from the double squirrel mark on 14 carat 0,585 gold that might be exported to Germany. Let me know if you see this mark without the German half moon and crown mark. The image here shows a 0.800 fineness mark surmounted by two pine cones. The pine cones were the case maker's trademark; the case maker stamped the 0.800 fineness mark and the Bureau de Contrôle counterstamped it with the grouse hallmark after it had passed assay. Watch manufacturers didn't allow case maker's names to appear, but discreet trademarks like this were sometimes allowed. Unfortunately, although I could find quite a few pine cones or cones, I have not been able to identify this mark. If you know whose trademark it is, please let me know. 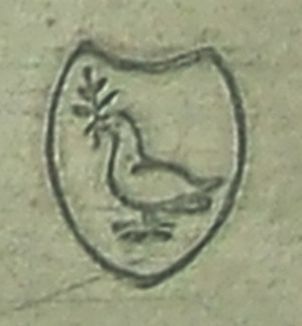 The case that this mark is stamped into has the German half moon and crown mark and two grouse, one large above the fineness mark and a smaller one below, shown in the image. The Swiss precious metals act of 1880 specified a 0.875 as the higher of two standards for silver. The standard is always a minimum fineness; there was nothing to stop manufacturers making watch cases from higher grades if the intended market required. The requirements of some export markets led to the adoption of some higher grades; 0.900 and 0.935, and eventually a change to the Swiss '‘higher standard’ from 0.875 to 0.925. Sometimes a standard mark of fineness of 900‰ or 0.900 is seen. This was never introduced into Swiss law as a standard, but 0.900 fineness silver was a popular grade in a number of European and other countries because it was the standard of coin silver. 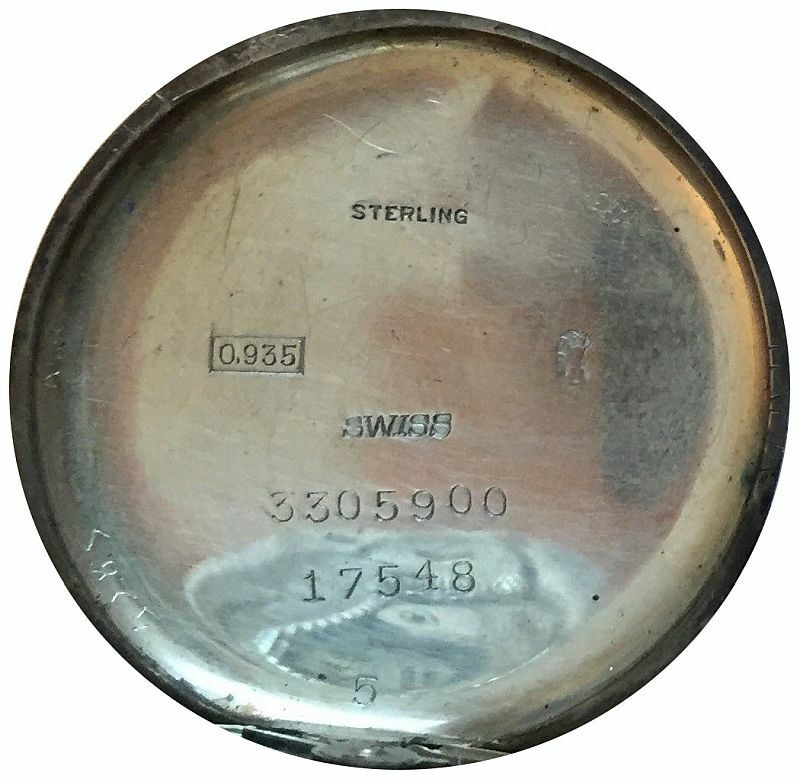 Watch cases that were to exported to a country where 0.900 was the standard were stamped by the manufacturer ‘0.900’ as shown in the picture here, and submitted for assay and hallmarking as normal. 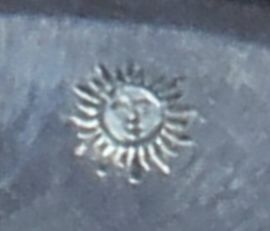 The '‘rampant bear’ hallmark was stamped by Swiss Bureau de Contrôle on silver that was at least 875‰, so the bear mark was applied to the item as shown in the picture — the faint mark above the 900 is the bear. The bear did not guarantee that the item was 900‰, only that it was at least 875‰. The British 1887 Merchandise Marks Act allowed the British Customs to accept silver items hallmarked in their country of origin, so long as they were at least of sterling standard fineness. 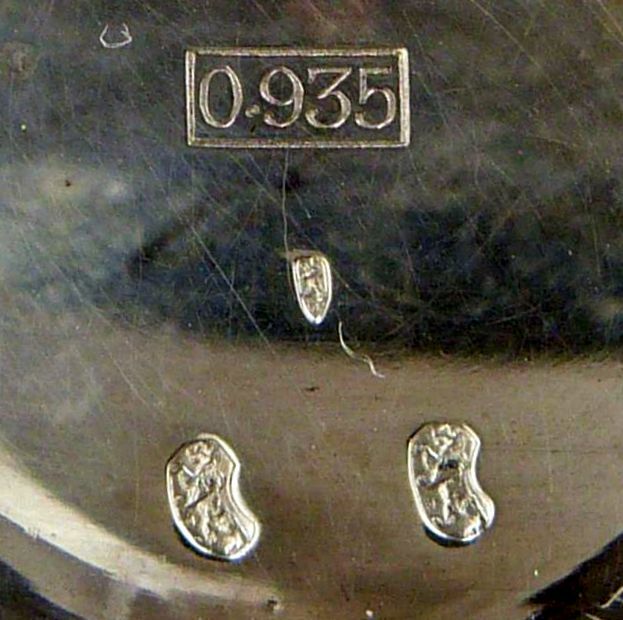 The Swiss Act of 1880 recognised only 0.800 and 0.875 silver as legal standards in Switzerland, and these were the only standards that could be hallmarked in Switzerland. This presented Swiss case makers with a problem, because neither of these was legal in Britain. This lead to the legalisation in December 1887 of recognition of a fineness 0.935 for official hallmarking of silver watch cases destined to be exported to Britain. The Swiss Bureaux de Contrôle were authrised to mark three rampant bears, one large and two small, on silver items that assayed at least 0.935 fineness. The standard of 0.935 was higher than the British legal standard, which was signified at the time only by the ‘lion passant’ hallmark, and the Swiss authorities did not know exactly what percentage fineness the lion represented. For more about this see the section below about 935 silver and the three bears. It is not clear when the Swiss authorities realised that British sterling silver was not 935 as they had thought. 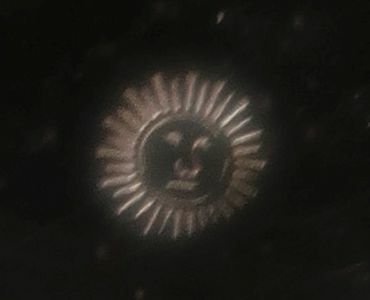 This might have been from 1 June 1907 when British assay offices started stamping imported silver watch cases with the explicit fineness mark of 925, instead of the lion passant used on British made items. Items are seen stamped with a 925 and a single bear, which shows they were marked before the 1933 Swiss Act. When this started I don't know, I suspect in the mid 1920s. My grandfather's silver Rolex has 0.935 and a single bear, and London Assay Office import hallmarks for 1918 to 1919. The Swiss recognised 0.925 as a single higher fineness for silver with a duck hallmark by an Act in 1933, in the process abolishing the previous 875 and 935 grades and the bear hallmark. See Precious Metals Control Act 1933. A single standard for platinum of 950‰ or 95% was introduced in 1914, signified by the head of a chamois goat. From 1933 the standard remained the same at 950‰ but the symbol was changed to an ibex goat. Goodness knows why; perhaps Swiss people find it easier to identify an ibex than a chamois: they both look like goats to me . . . They were hallmarked in Britain with special "Foreign" hallmarks. They carried a foreign country's hallmark. They carried British hallmarks and an equally conspicuous statement that the watch was of foreign make. Between 1874 and 1887 a small number of Swiss watch cases were sent to Britain to be hallmarked, returned to Switzerland to be fitted with movements, and then exported to Britain. 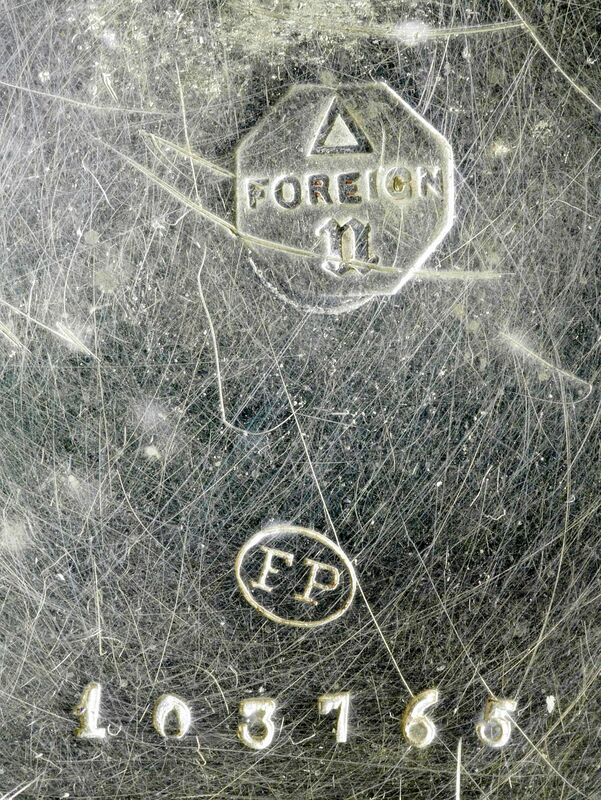 The Merchandise Marks Act effectively stopped this practice by creating special hallmarks for watch cases with the word "Foreign" prominently across the middle, as shown in the image here, which understandably was not desired by Swiss watch importers. Examplkes of this style of hallmark are extremely rare. Neither of the two Swiss legal standards for silver, 0.800 and 0.875, met the minimum legal British standard of sterling. The Swiss authorities were not exactly sure what the British fineness standards were for sterling silver or 18 carat gold. Swiss law did not allow nine carat gold to be hallmarked. Watches that did not have a place of origin clearly identified were liable to seizure by the British customs. A letter in the "Watchmaker, Jeweller and Silversmith" in March 1888 from a Swiss national working in an English Customs house reported that Swiss watches that would previously have been admitted were now being confiscated. Watches bearing the mark "Warranted 0.800 silver" were confiscated on two grounds, the first naturally that 0.800 silver was below the sterling standard, but also under a provision of the Merchandise Marks Act that the use of English words without a clear statement of place of origin would be deemed to fraudulently indicate that a watch was made in England. 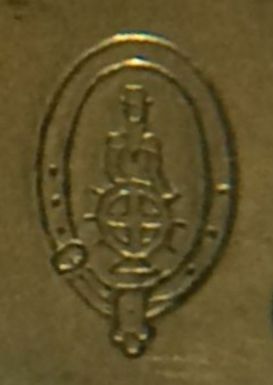 The English words Warranted Silver without any other mark showing the place of origin were sufficient for a watch to be seized by the Customs. The words Patent Chronograph, or even simply Fast and Slow on the regulator, without a stated place of origin similarly condemned an imported watch. Swiss assay offices were authorised to hallmark a new silver standard of 0.935, discussed in the section below 935 silver and the three bears. Swiss assay offices were authorised to hallmark a new gold standard of 0.755, discussed in the section below 755 gold and three heads of Helvetia. Swiss watch case manufacturers started to mark nine carat gold cases with pseudo hallmarks, discussed in the section below Swiss Nine Carat Gold Marks. A new national "brand" for Switzerland was marked on watch movements and dials, discussed in the section below The national brand "Swiss made". The Swiss Federal Council of December 1887 that introduced the three bears mark for 0.935 silver also defined a new mark of three heads of Helvetia, two large and one small, for items of 18 carat gold exported to England. The fineness standard was also altered from the Swiss legal minimum for 18 carat gold of 0.750. For eighteen carat gold watch cases that were to exported to England a new standard of 0.755 was introduced. 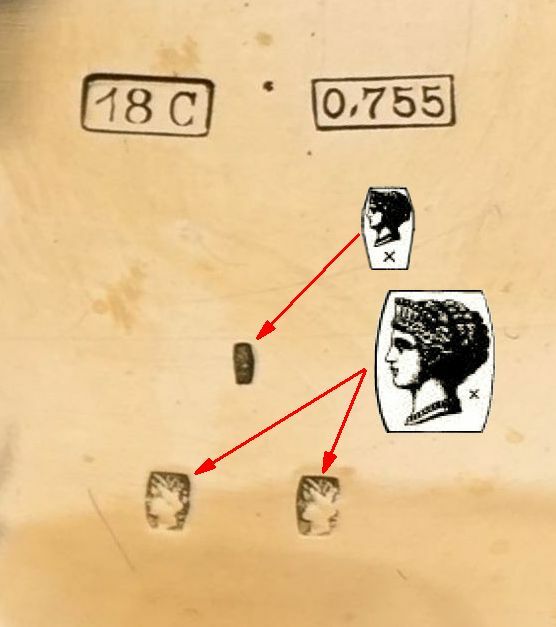 The fineness stamp could be either one stamp of 18C or 0.755, or two stamps of 18C and 0.755. Each stamp was incuse and surrounded by an incuse rectangular shield. The image here shows the full set of marks in the back of a watch case: 18C and 0.755 within rectangular shields and three heads of Helvetia, two large below one small. The marks in the gold are indistinct so I have added the marks with the white backgrounds and red lines to show how they would have looked originally. The reason for the change in fineness from 0.750 to 0.755 was not explained in the Federal Council decree but the British fineness marks for 18 carat gold were a crown and the figure 18, the decimal fineness was not marked by British assay offices at the time. A Swiss clerk tasked with the job of framing the new standard might have decided to simply get hold of a piece of British hallmarked 18 carat gold and have it tested. Alloys slightly above standard were usually used by goldsmiths in order to make certain that the work would pass assay, because failure meant that the piece would be "battered" and the work of making it lost. When tested in Switzerland this could have easily have assayed at 0.755, hence the higher fineness stipulated by the decree for items being exported to Britain. The phrase "plaqué or" means gold plated; rather confusingly for English speakers, the Swiss/French word for gold is "or". "Plaque or", or "plaqué or", usually means the item was made from material plated with thin sheets of gold mechanically bonded or welded to a base metal core, rather than plated by electro-deposition. This is often accompanied by a guarantee such as "garanti x ans", which means "guaranteed to wear for x years", usually 10, 20 or 30 years, before the base metal shows through. The extract from La Fédération Horlegère Suisse from May 1926 shown above says that the Bureau of Control are responsible for the guarantee of duration of the plate - la duree du plaque - that is marked, as well as any other indications that are marked. When Plaqué is used on its own without the additional "or" it usually means gold plated by electroplating. A thin layer of gold is deposited onto the finished item by putting it into a solution of gold salts and passing an electric current through the solution and the item, which deposits an extremely thin layer of pure gold onto the item. This is cheap because the quantity of gold deposited is very small, usually far to small to weigh. A guarantee of wear cannot be made for electroplated gold because it is so thin that it wears through very quickly. For more about the different types of plating see metal plating. Some changes to Swiss hallmarks were made by the Precious Metals Control Act of 20 June 1933. From 1880 to 1933 there were two Swiss standards for gold, 18 carat signified by the female head of Helvetia, and 14 carat signified by a squirrel. These standards continued after 1933 with the same marks, but the sign of the morgenstern (which translates literally as "morning star"but was actually the name of a rather evil looking medieval spiked club or mace) was added for 375‰, i.e. 9 carat, gold — but only for watch cases as the note in the figure shows. Since 1907 the UK assay offices had been stamping imported silver watch cases that tested as sterling with .925 instead of the lion passant, so it was obvious to all and sundry what was the legal standard for sterling silver. So in 1933 a silver standard of 0.925, the same as British sterling, was introduced in Switzerland, identified by a symbol of a duck. The bear and the 0.875 standard were discontinued, as was the semi-official standard of 0.935 and the three bears. The grouse continued as before to signify for silver of 0.800, which was not imported into the UK. It is possible in watch cases made before 1933 to see both the Swiss .935 and the UK hallmark .925 stamped in the same case. There is no conflict between the .925 and .935, because they are both the standard or guaranteed minimum purity of the metal, not its actual purity, which is usually a little higher then the standard to ensure that the assay test is passed. A single standard for platinum of 950‰ or 95% had been introduced in 1914, signified by the head of a chamois goat. From 1933 the standard remained the same at 950‰ but the symbol was changed to an ibex goat. Goodness knows why; perhaps Swiss people find it easier to identify an ibex than a chamois: they both look like goats to me . . . 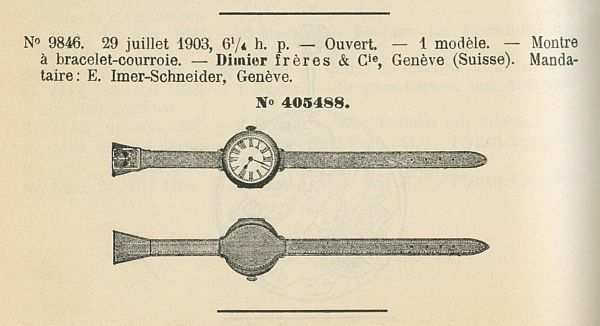 In 1903 the Anglo-Swiss company Dimier Brothers registered a design of a wristwatch with fixed wire lugs and a leather strap. This is the earliest documented evidence I have seen of watches with wire lugs and one piece leather strap; the first purposely designed man's wristwatch, which during the Great War became known as the "trench" or "officers" watch. 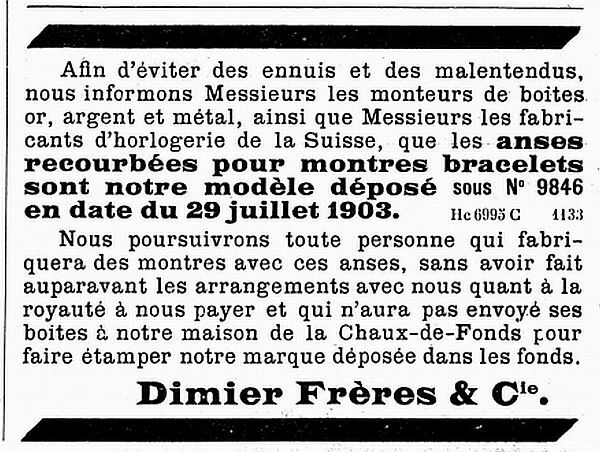 Dimier Frères & Cie had offices in la Chaux-de-Fonds and London. As Dimier Brothers & Co., from 1868 were an important watch importing company in London, You can read more about the London company of Dimier Brothers on my Sponsors Marks page at Dimier Brothers & Co. . Evidence for the involvement of the Dimier Brothers company in the early development of the wristwatch is the legend "Déposé No. 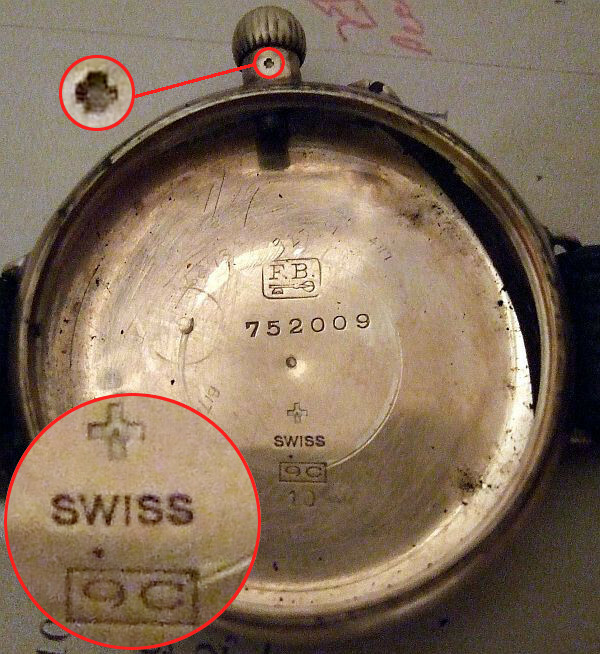 9846" (sometimes "DEPOSE 9846", or even DÉPOSÉ 9846) which is often seen on the back of very early wristwatches as shown here, sometimes with the Swiss Federal Cross symbol, sometimes without. Déposé is shorthand for Modèle Déposé, which is Swiss/French for "Registered Design". An author's or designer's legal copyright exists for designs whether they are registered or not, but it can be difficult to prove without evidence of the date the design was created; hence, an entry in a register is a useful official record. NB: a "Registered Design" is not the same as a "Patent", which is something quite different. The picture to the right here shows the official Swiss register entry for Modèle Déposé No. 9846. It is dated 29 July 1903. 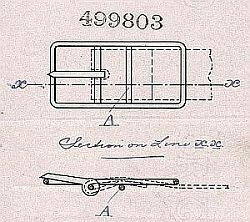 As you can see, the description is very short compared to that of a patent: it simply says "Montre à bracelet-courroie" or "Wristwatch with bracelet-belt" and shows a picture of the design. That's it; that is the full entry. The exact translation of Montre à bracelet-courroie is important. A "montre" is a watch, "à" means with and "bracelet" is a bracelet, but a "courroie" is a belt. The addition of courroie or belt is clearly intended to distinguish this design from a "montre bracelet", a watch on a metal bracelet which ladies had been wearing for hundreds of years. So the specific design features being registered were the use of a leather wrist strap like a belt, and by implication the "anses", handles or wire lugs, that attach the watch case to the leather strap. This is the earliest documented evidence I have seen of wristwatches with fixed wire lugs. An interesting feature of the strap design is the flared centre section. This approximately covers the same area as the watch case. Since there is no description its purpose can only be guessed at. It could have been to prevent any part of the watch case from touching the wrist for some reason, perhaps concerns about allergies, or about perspiration tarnishing silver watch cases. Or, which I think more likely, it would not have been possible to register a design that was just a straight leather strap, because that would be too simple and obvious, so this more elaborate design was conceived just so that it could be registered. Once a registered design number had been secured, that fact could be used in advertising and to gain a hold over wristwatch manufacturers. There is a second number in the picture of the Swiss Registered Design. This is No 405488, underneath the main block of text with the registration number 9846. I discovered that this is the number of a British Registered Design, a design that was formally registered by the British Board of Trade for the purposes of copyright protection, in much the same way as the Swiss/French Modèle Déposé discussed above. The picture here shows the entry in the register. This is the full entry, there is no text description. The watch shown mounted on the strap in the picture is crossed out to show that it is not part of the actual Registered Design. This design was registered by the British Board of Trade in February 1903, six months before the Swiss register entry for Modèle Déposé No. 9846 in July 1903. Watch straps with the same flared centre shape as the British and Swiss Registered Designs are sometimes seen with the British Registered Design number "No. 405488" stamped onto the leather strap, and with another British Registered Design number, "No. 499803", stamped on the buckle. Buckles stamped with this number are an unusual design with two centre bars instead of the more usual single bar. 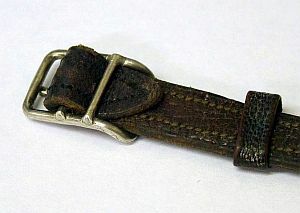 The British Board of Trade records show that this unusual design of buckle was first registered in April 1907, but they don't show who the registrant was. However, the juxtaposition of the numbers 405488 on the leather strap and 499803 on the buckle, and then the number 405488 on the Swiss register entry for Modèle Déposé No. 9846, indicates that they were all the products of Dimier Brothers. The Registered Design No. 499803 buckle is an unusual design with two centre bars and it fits onto the strap without being stitched into it. The Registered Design No. 405488 / No. 9846 shows a strap with a circular section the same size as the watch case in the centre, and there are only two ways such a strap could be fitted to a watch with fixed wire lugs, either the buckle would have to stitched to the strap after the strap had been fitted to the watch, or the buckle would have to be designed to fit to the strap without stitching, which is exactly what the Registered Design No. 499803 buckle does. The photograph here shows how it fits to the strap. To avoid trouble and misunderstandings, we inform Gentlemen makers of watch cases of gold, silver and metal, and Gentlemen watch manufacturers of Switzerland, the curved handles for wristwatches are our registered design No. 9846 dated July 29, 1903. We will pursue anyone who manufacture watches with these handles, without having previously made arrangements for a royalty to be paid to us, and that does not send his watch cases to our factory in La Chaux-de-Fonds to have our registered mark stamped in the case back. This announcement gives more details than appear to be recorded with the registered design. 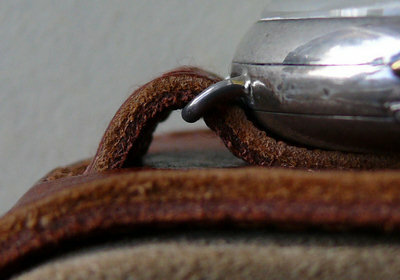 It is clear that the wire lugs ("anses" or handles) are designed to be curved (recourbées) or bent downwards, so that the lugs can be soldered to the middle part of the case and not interfere with the hinged opening back whilst making the path of the strap around the back of the watch case follow a natural curve. It's not rocket science, but someone had to think about it. Judging from the very large number of early wristwatches that are stamped in their case backs with the legend "Déposé No. 9846", the claim that Dimier Brothers originated the design and the threat of action against anyone who didn't pay them royalties for making wristwatches with fixed wire must have been taken seriously by Swiss watch manufacturers at the time. The Swiss Federal Cross is often seen in cases and on movements. It is usually a reference to a patent, and if it is followed by a number, then that is almost invariably the number of the patent. Brevet Dem., Mod. Dep., etc. In Swiss/French "brevet d'invention" means patent, this is often abbreviated to simply brevet. "Modèle" means design, "deposé"means to file, lodge or deposit, and "demandé" means requested. Combinations of these words, often together with the Swiss Federal Cross symbol, are often found in the backs of watch cases. The Swiss Federal Cross usually signifies that a Patent has been granted. If there is a number it indicates the patent number, often no number is quoted. Brevet On its own or with the Swiss Federal Cross usually signifies that a Patent has been granted, a number indicates the patent number. Brevet Deposé Sometimes abbreviated to "Brevet Dep." This seems to mean "Registered Patent" - perhaps that an application for a patent has been registered but the patent not yet granted, the same as Brevet Demandé. Brevet Demandé Patent Requested. Sometimes abbreviated to Brevet Dem., Brevet Dem, or just Br. Dem. Modèle Déposé Registered Design. Sometimes abbreviated to Mod. Dep., Déposé or just Dep. Dep. or Dep. Dep. on its own or with the Swiss Federal Cross usually means Modèle Déposé as above. Modèle Déposé does actually mean something, the design has been officially recorded and "registered", the same as a British "Registered Design". This doesn't convey protection in the same way that a patent protects an invention, but it forms an official record of who first produced the design and can be used in cases of copyright dispute. Aguilles Hands. 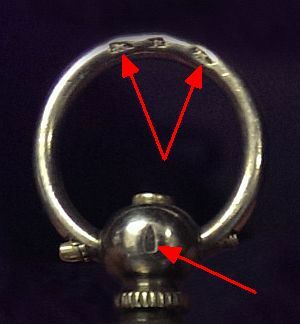 Often engraved on an inner cuvette next to a hole to show where to put the key to alter the hands. Ancre Lever escapement ("anchor" from the shape of the lever and the pallet fork carrying the pallets). Ancre Ligne Droite Straight line lever escapement. In a Swiss straight line lever escapement the pivots of the balance staff, the lever and the escape wheel are all in a straight line, as opposed to the English lever where they form a right angle. Argent Silver gilt (gold plated silver) was stamped Argent so that it was not mistaken for gold. Balancier compensé Compensated balance, a balance that compensates for the effect of temperature changes. Usually a "cut bimetallic balance" that changes its radius of gyration with temperature to compensate for changes in the strength of the balance spring. Cuivre This is the Swiss/French word for "copper". It is often seen on the inner cover or cuvette inside the outer watch case back to indicate that it is made of base metal. These inner cuvettes are usually gold or silver plated and without this word stamped on them could be mistaken for being gold or solid silver. Cylindre The movement has a cylinder escapement. Double Plateau Double roller - a lever escapement with separate impulse and safety rollers. Older lever escapements had a single roller. Eschappement Escapement - usually either ‘cylindre’ (see) or lever. Galonné Silver that was mechanically gold plated, as opposed to electroplated. Gold leaf was hot rolled onto silver in a process similar to making Sheffield plate. Because the gold leaf was very thin, the gold plating wore off fairly easily. The gold leaf was much thinner than the silver plating used to make Sheffield silver, or the layer of gold of rolled gold or gold filled items. It was similar in thickness to electroplate. Levée Visibles A lever escapement with visible pallets. Earlier pallet stones were set into the steel body of the pallet fork so that their top and bottom faces were covered. It was found that pallet stones were sufficiently well retained by shellac that they could be set into simple slots in the pallet fork, leaving their top and bottom faces visible. Metal Seen on the inner cover or cuvette inside the case back to indicate that it is made of base metal: see cuivre above. Plaqué or Plaqué means plated; rather confusingly for English speakers the Swiss/French word for gold is ‘or’ so ‘plaqué or’ means gold plated. Usually ‘plaqué or’ means gold filled or rolled gold, whereas ‘plaqué’ alone without the ‘or’ usually means electroplated. P.O.G ‘Plaqué Or Galvanique’ means electroplated with gold. Rubis Jewel bearings, which were originally made from natural ruby gem stones, superseded when the French chemist Auguste Verneuil found a way to make synthetic sapphire. Sapphire and ruby are variations of aluminium oxide, the different colours produced by traces of other elements. Spiral Bréguet Breguet balance spring, a balance spring with an overcoil. The overcoil was invented by Breguet to make the balance spring expand and contract more evenly as the balance swings backwards and forwards and the spring winds and unwinds. This improves isochronism, and springs with overcoils are called Breguet springs in his honour. Trous Literally ‘holes’. In this context it refers to hole in the plates or bridges that are bearings for the arbors. These are often set with jewels to reduce friction and wear, e.g. "Huit trous en Rubis" means eight jewel holes made of rubies - real gem stones.